so much for asking people if they’d rather be able to fly or be invisible. that’s such a great question too – you can tell a lot about someone’s character based on their answer…anyone who chooses invisible is a pervert. if you were offended by that statement and would like to act like you were going to use your invisibility for a nobler use* – don’t. cause then i’ll think you’re a liar too. the ones who want invisibility are deceivers. they’re con artists. they look to spy and creep and sneak around. real sleuth types. they’re shifty shifty characters and cannot be trusted. now flying, on the other hand, makes perfect sense. it’s practical on so many levels: gas prices, time, convenience, enjoyment – none of which are shifty. flying is the way to go. but thats not what’s important here. what IS important is that we’re actually freaking doing it. like the article says, ‘what is this, harry potter?’** science is advancing at a scary rate nowadays. we’re tampering with rather unhealthy things. while technology is a great thing (i mean, hello, i’m typing this on my macbook, wirelessly on the internet – what did any of those things mean 15 years ago?) it’s still scary. example: atomic bombs. example: airplanes. example: the internet. example: credit cards. all technologies that can be, and have been, utilized as something other than an asset to society. 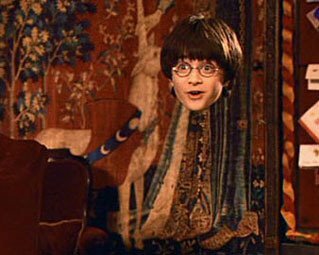 so when berkeley claims they’ve made progress toward an invisibility cloak i can’t help but shudder at the implications. i’m assuming that it won’t be available to the public if it ever makes it for real – that just spells disaster in jails and locker rooms – but just the thought of it being possible is pretty unnerving. oh sure, harry, ron and the lovely hermione are able to utilize it in the vanquishing of voldemort, but lets be honest with ourselves, the wizarding community is, as a whole, a much nobler society than mankind…even if ron has had some less-than-pure thoughts about the cloak’s use. i guess it’ll probably continue as long as the conveniences continue to outweigh the negative implications. why don’t we work on genetically altering humans so we can fly instead? that seems like something i’d rather dabble in. however, when it comes to invisibility cloaks i might have to draw the line. i just can’t see them ever being a betterment to society. * – military use is not noble either. why is it that with every new invention America’s gut instinct is to use it militarily? does that seem slightly unhealthy to anyone else? ** – this isn’t verbatim from the article, but it’s undoubtedly the writer’s initial thought. >notice .228, 0 for last 22, 1 for last 30 or so i think. oh johnny, what has happened…? >Yeah, I heard about that. Pretty crazy if it actually works. I don’t think I’m quite as pessimistic as you about this, though. I mean, pretty much any technical innovation is a tool that can be used for good or evil. Doubtlessly it will be used for both. Does that mean we should stop innovating altogether? I don’t think so.Also, there’s a really cool NPR story where they interview people about flying vs. invisibility. Check it out. Previous Previous post: >pga championship.